It Seems Operational Technology of Bass Fishing Reels Evolves As Fast As Does Computer Technology! How Many Types of Fishing Reels? 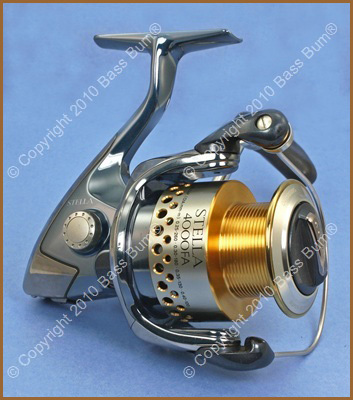 There are four or five types of fishing reels used for bass fishing. These have been touched upon on other pages in this site, Bass Fishing Tackle and Types Of Fishing Reels. All reel styles, save maybe spin casters, have experienced rapid and significant change in just the last five or six years. Changes have been made in attempts to reduce line twist, backlashes in baitcasting reels and "bird's nests" with spinning reels. Drags and brakes have been improved and numbers of ball bearings can be found as high as 12. There are even reels within which are found micro processors, basically very small computers. In this section we'll look at each type in greater depth. We'll focus on the differences in design, function and application and how they translate into the features and benefits of each. These reels feature "freespool" casting and a set of gears that, as the reel is turned, provide power from the handle to the spool. The freespool feature requires what is sometimes referred to as an "educated thumb" despite the many cast control systems found on today's baitcasters. Primarily heavy-duty fishing reels many anglers will not think of using line lighter than 12lb test despite the fact many are rated for lines as light as 8lbs, some even 6lbs! They are "free spool", that is, one whose spool revolves freely from the weight and momentum of the lure as it is cast. Available in "low-profile" and "round" shapes. The first usually for freshwater, the latter for saltwater fishing. Prone to backlashing in less experienced hands. Provide angler power and casting distance. Most are equipped with a drag systems, a spool tension knob, external adjustable brake, thumb bars and "levelwind" line distribution. These bass fishing reels have fixed spools parallel to the axis of the rod. A housing mechanism that fits around the spool revolves around it as the handle is turned. It also includes a "pickup bail" which distributes the line in even layers along the spool as it is driven up and down by internal gears. 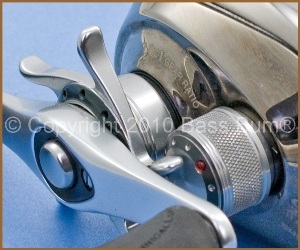 Generally, though not always, spinning reels are intended for use with line 17lb test or less with many being rated for 6-12lb test. Have far more parts than baitcasting reels. More parts, more to go wrong, potentially. Unlike baitcasting reels these have stationary spools. Line winds on the spool by a bail that rotates around the spool. Are more often used with lighter lures (under an ounce) than are baitcasters, which can be an advantage when casting into the wind. Best reel choice for "finesse" techniques. Manufactured so the handle can be positioned for either right or left handed anglers. Usually equipped with "front drag control knobs" though some have rear drag control. Spinning reels with anti-reverse locking handles should be chosen over those that don't. 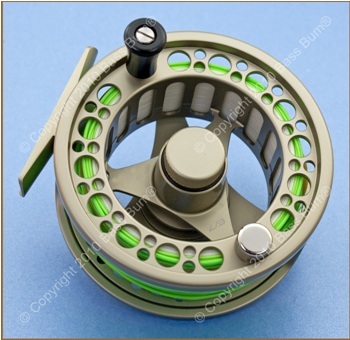 These are reels that are good for beginning fishermen and children. Their design enables fairly long casts and are quite tangle free. Like spinning reels, these have stationary spools. A pin mechanism rotates around the spool, which is enclosed in a covering that earned these reels the name "closed face", depositing line on it. The line exits through a hole in the cone cover when the push button is depressed by the angler. Spincasting reels are located "on top" of the rod as are baitcasting reels though some recent versions are manufactured to be positioned under the rod like spinning reels and have levers, instead of freespool buttons, that are pressed to release line. Fly reels are simple in design with their primary functions being line retention and retrieval with have no role in casting, as do spinning and baitcasting reels. They are manufactured..
For bass you don't need a high end, expensive drag on your fly reel. Since bass, particularly largemouth bass, aren't known for long runs that strip off 100-200 yards of line, a reel capable of handling enough line to handle such runs isn't necessary. Having said that, it's often likely a smallmouth bass will run if hooked in a stream or river so a fly reel with a "good" drag should be your choice if targeting either largemouth or smallmouth bass. Remember, once you've hooked a bass, especially one of some size, the reel and its quality become very important. It's the mechanism that lets line out and does so without tangling. So while you may not need the most expensive you need one that has high enough quality to perform consistently and reliably. Gear Ratio - A key feature of bass fishing reels which refers to the number of times a spool makes a complete revolution with each turn of the handle. This translates, obviously, into how fast line and lure are retrieved as the reel's handle is cranked. The key indicator is "inches per crank" as different manufacturers have different reel shapes and sizes. So a 6.3:1 from one brand reel may be a little different in inches picked up than the same ratio from another. But a 6.3:1 ratio means the spool turns six revolutions for each turn of the handle, regardless of manufacturer. Such a ratio will pick up 26-28" per crank depending on the reel manufacturer. Ratios on bass fishing reels range from as low as 3.8:1 to as high as 7.3:1 with the most popular being 5.1:1 to 6.3:1 for baitcasting reels and 5.2:1 for spinning reels. Reel Drag - The drag on bass fishing reels is a mechanism which applies pressure or tension to the spool, sort of like a clutch. This is accomplished by virtue of a stack of disc washers that are compressed, tightened, when pressure is added and released or eased when pressure is reduced. This action allows for line to run off the reel even when engaged when a fish is hooked-up and makes a hard run. This prevents the line from breaking and enables the angler to better control the fish. Ball Bearings - Ball bearings, one of man's greatest inventions, are what make a reel function smoothly and give a reel that even, non-jerking rotation that gives we anglers the distinct feel of solid quality when we pick it up and spin the spool. It's accepted among fishermen that the more bearings a bass fishing reel has, which currently vary from three to twelve, the smoother and more long lasting its performance. While generally true, it's not always the case. Very simply, not all ball bearings are created "equal". So look for quality first, then quantity. Brakes - As you would expect, brakes on a bass fishing reels, specifically baitcasting, are there to slow the rotation of the spool and minimize the occurrence of backlashes. 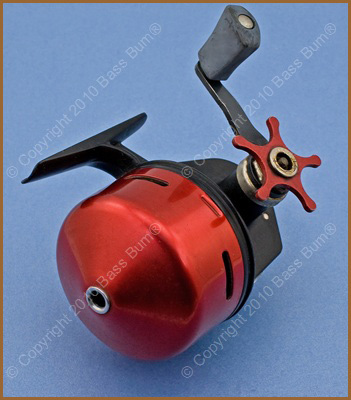 In the case of baitcasting reels there may be as many as nine brakes, though usually but two, that are functioning while the reel is in freespool. Brakes are magnetic or centrifugal or a combination of the two. Adjustment is achieved via an external tension adjustment knob ( as seen in the photo right)or by taking off a side plate to gain access to the brake adjustment "pins". Spools - The reel component around which the line is wound. On baitcasters these are usually manufactured from aluminum or graphite. The consensus is the former tends to more durable and stronger than graphite spools. Many now are produced with holes drilled through the spool body. Why? To reduce weight and increase casting distance. So say bass fishing reel manufacturers. Spools found on spinning reels are either internal or skirted, though the internal spools are rapidly fading into history because of their propensity to create line tangles. Additionally, in recent years spinning reels called "super casters", "long casters" or "wide spool" have been introduced. These reels sport spools that are of a wider diameter than traditional spinning reel spools and supposedly facilitate longer casts due to a reduced coefficient of friction. 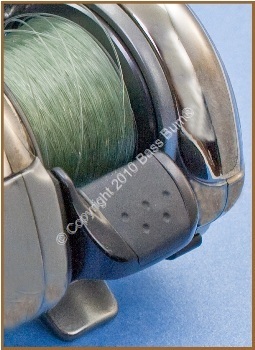 It is further claimed they accommodate "braids and superlines" whereas traditional spinning reel spools do not. Anti Reverse Switch - prevents the reel's handle from turning backwards. A reel turning backwards is not a good thing when setting the hook as line will come off the spool. A guide through which the line runs from spool to rod. This device, which moves back and forth on a worm shaft positioned in front of the spool, insures the smooth and even deposition of line on the reel's spool. 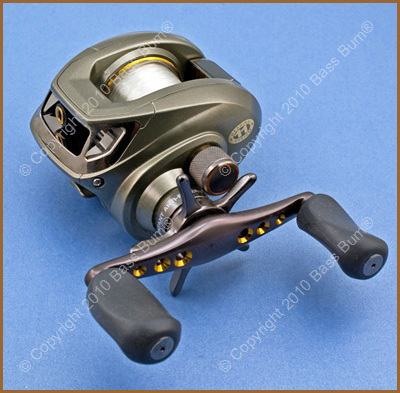 The overwhelming majority of freshwater bass fishing reels feature levelwind mechanisms. Thumb/Clutch Bar. The thumb bar is the mechanism on bass fishing reels that releases/unlocks the spool allowing line to escape the spool as the lure is propelled forward. When casting you press the thumb bar while keeping your thumb on the spool. At that point the reel is in free spool mode but held in check by your thumb. So What The Heck Is A Fishing Reel Gear Ratio?